Former Chester striker Ron Davies has hit the headlines recently with the news that he is in urgent need of a hip replacement operation. The Holywell-born forward, who now lives in a mobile home in New Mexico, needs to raise £10,000 to finance the surgery that could prevent him from ending up confined to a wheelchair. The supporters of Southampton, where he enjoyed his most successful days, have recently launched the “Give It To Ron” campaign in order to help the 65 year old ex-Welsh international who has fallen on hard times in America. Ron started his career as a junior at Chester in the late 1950s and such was his promise that manager Stan Pearson gave him his debut at Workington after scoring a hatful of goals for the Reserves. Although Chester were well and truly thumped 5-0 the 17 year old did enough for Pearson to include him in the side the following week when he scored against Doncaster Rovers in his first game at Sealand Road. The 1960/61 season saw Ron begin to make a name for himself scoring 23 goals in 39 games even though Chester ended the season 92nd in the Football League. 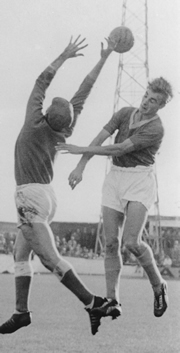 Ron continued to find the back of the net in 1961/62 – finishing leading scorer with 13 goals – although the team remained rooted at the bottom of the table. However, the strain of playing in a struggling side was beginning to show and the youngster often found himself the subject of criticism from the Stadium fans. By the start of 1962/63 Ron had been dropped to the Cheshire County League side and had asked to be put on the transfer list but an impressive performance for the Reserves, against Bangor City, saw him return to the first team alongside Irish international Peter Fitzgerald. It proved to be a perfect pairing, and Ron regained some of his earlier form netting ten goals in eight games including a four goal haul against Southport. With Liverpool and Wolves reportedly showing an interest it was Luton Town who stepped in for his signature and the big Welshman moved to Kenilworth Road in October 1962 for £12,200. Following Luton’s relegation Ron moved on to Norwich City followed by Southampton for a record £55,000 in 1966. The move to the Dell proved to be the making of Ron and over the next seven years he scored 134 goals in 240 games including 37 during the 1966/67 season, a total that has not been bettered in the top flight since. In August 1969 Ron scored four times at Old Trafford against Manchester United a feat that prompted Matt Busby to describe him as “the best centre forward in Europe” and he was the subject of a huge bid of £200,000 from United which was turned down by the Saints board. His later years were marred by injury as the strain on his body began to take a hold and he wound down his career playing for Portsmouth, Manchester United and Millwall before moving to America where he played for Los Angeles Aztecs. Widely regarded as one of the finest centre forwards to grace the game Ron often put down his phenomenal aerial ability down to the training he received at Sealand Road in the 1960s. Bill Lambton took over as manager at Chester in January 1962 and his eccentric training methods certainly left a lasting impression with Ron. “Iron Man Bill” was a former Sergeant Major who believed in training based on physical fitness and Ron was made to jump hurdles wearing heavy army boots. As Ron himself said “when I took those boots off I felt I could jump over the moon.” Ironically it was the training methods that started him on his successful footballing career that have brought about his current health problems and it is to be hoped that the efforts of the Saints fans to rally around their former hero are successful.